October 22nd, 2018 – Joey Chestnut won $10,000 from the 2018 Nathan’s Fourth of July Hot Dog-Eating contest after downing 74 hot dogs in 10 minutes. Geoff Esper banked $4,000 for eating 19.25 9-inch personal pizzas within 10 minutes at the Vaughan Pizza Fest World Pizza Eating Contest. And Darron Breeden claimed top prize at the Acme Oyster House World Oyster Eating championship this year after slurping down 480 oysters. He didn’t win any prize money, but he did receive a champions belt. Oh shucks. Here are some other facts: choking is the fourth leading cause of unintentional injury death, 795 million people worldwide don’t get enough food to live a healthy life, Americans waste 150,000 tons of feed every day – breaking down to a pound per person, and several people have died while competing in food eating challenges across the globe. The league seems to understand that even weapons of mass digestion can sometimes malfunction. And while they do list several safety standards to which they require participants to adhere, that hasn’t stopped tragedies from happening. In 2014, a South Dakota man was competing in a 4th of July hot dog-eating contest when he began to choke and lose consciousness. He was given CPR at the event, but the 47-year-old later died at the hospital. 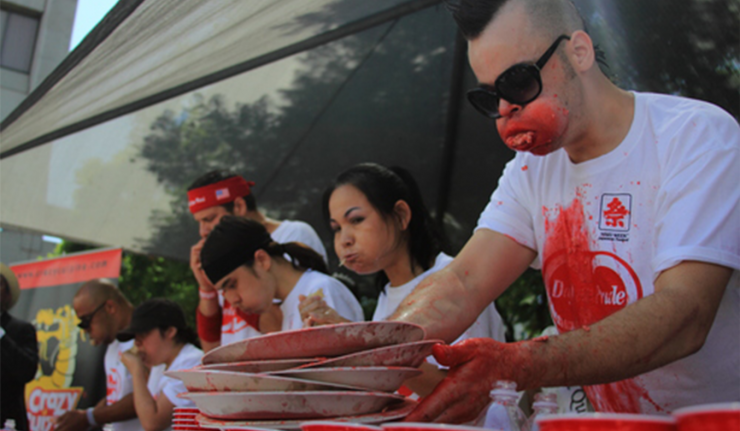 Outside of the U.S., competitive eaters have also met fatal ends even after they’ve secured first place. Lyana Korolev, a 53-year-old Ukrainian woman ate 100 dumplings in less than 20 minutes but died from a heart attack as she waited to be crowned. Eating competitions have a history as far back as the 1400s, as historians have looked through poetry and prose from the 13th and 16th century to find evidence of the sport being celebrated. 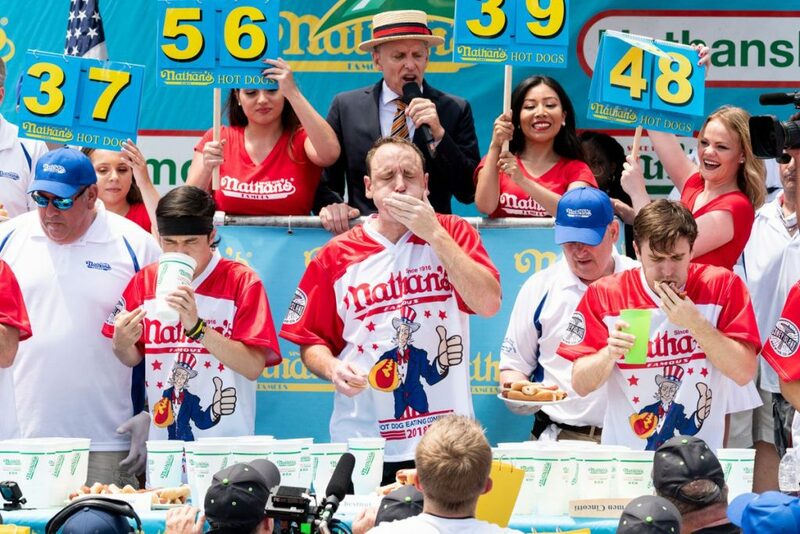 The Nathan’s Famous Hot Dog Eating Contest has been going on since 1916. In recent years, however, society has become more vocal in its opposition to the tradition. Putting aside personal health risks, people also object to the sport on moral grounds. Americans have a reputation for being wasteful, and several writers have considered that negative connotation when writing about the topic. Diana Nyad, a competitive swimmer and journalist, reminded readers about the impact competitive eating may have on people fighting illnesses for a piece in Huffpost. “What does a person fighting esophageal or stomach or rectal cancer, hoping one day to return to normal function, thinking of their organs with desperate tenderness, feel when they witness the assault on the digestive system of these professional gorgers?” she wrote in 2013. Taco, shrimp cocktail, and croquette-eating contests are all on the docket in the coming months for Major League Eating. All have cash prizes in place for the winner only, but some past competitions have allocated winnings for various charities.